This is the time of the year in Ohio when female spiders of many web spinning species reach maturity. They become most evident when their gossamer creations are illuminated by early morning sunlight reflecting off a heavy dew. I was lucky to experience this magical but fleeting light effect during an early morning hike around my neighborhood a few days ago. I was amazed by the sheer number of spider living near at hand. 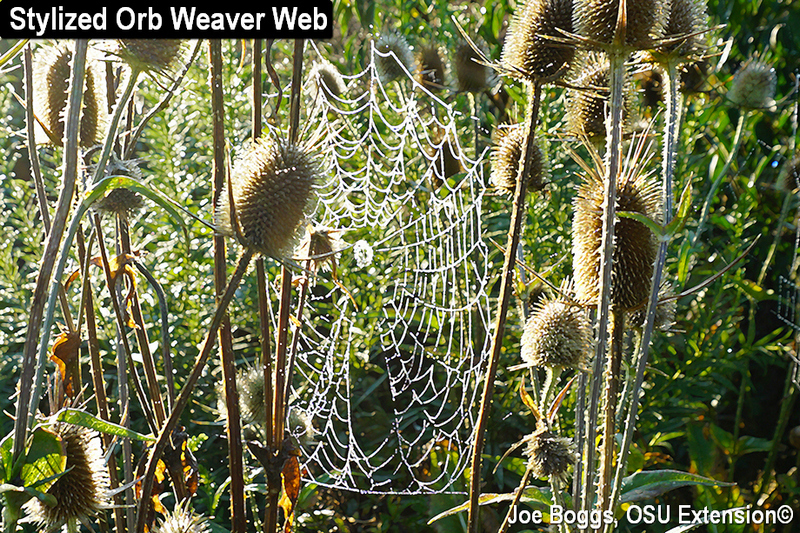 As their common name describes, orb weavers produce flat, circular (orb) webs. The webs are intricate structures involving both sticky and non-sticky silk. Non-sticky silk is used for "radial threads" which radiate from a central point like spokes on a bicycle wheel. The non-sticky silk is also used for "frame threads" which encircle the web like a bicycle wheel to hold the radial threads in place and to attach the web to supports such as plant stems. "Spiral threads" are composed of sticky silk arranged in a spiral pattern emanating from the center of the web; it's the sticky silk that captures the spider's prey. The closely related and similarly sized Banded Garden Spider (A. trifasciata) produces exactly the same type of orb web. This spider is also native to Ohio; however, it's not as common as its black and yellow cousin. Funnel weavers produce large, flat, sheet-like webs spun across grass, under rocks or boards, or over the branches of shrubs such as yews and junipers. The webs slope gently towards a narrow funnel or tube where the spider resides, awaiting its next victim. The spiders are medium-sized and resemble small wolf spiders. Funnel webs may measure more than 1' across and can become very evident with dew, or when they snare dust during droughty conditions. Spiders eat insects and research has consistently shown they remove a significant number of pests that we would have to deal with otherwise. Of course, numerous arachnid engineered insect traps draped over low growing shrubs can look like Halloween decorations. Continually removing the webs will eventually cause the spiders to take a hint and relocate elsewhere. If you see the spider on the web, just shoo it off before destroying their web so you don't accidently commit and arachnicidal act.